Mr. Jackson is made to sit and is 9" tall seated. He has a weighted bottom and is free standing. O.K., I can hear you now! "Does he have a head?" Of course he does!! He is holding it. Yes, I took a lot of grief on this one! My family was pretty critical, but the best one was from my son, "So what happened Mom, Did the raven eat his head?" Ha, Ha, Good one Andy! 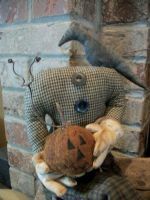 Anyway, Jackson is "Holding" his pumpkin head with stained canvas garden gloves. The head is made of wool felt and is hand embroidered, sculpted, & grunged. I have added a piece of grapevine as a stem (some still have a few dried grapes on!) His clothes are homespun brushed flannel with 2 vintage black buttons sewn down the front of his shirt. Jackson's boots are painted on & they are laced up. 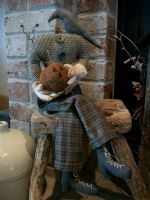 Mr. Jackson will be a delightful addition to your prim home this fall!! You can also find Mr. Jackson on my pattern page so you can make your own! Featured in the 2010 Aug/Sept issue of Country Sampler Magazine. $36.50. FREE SHIPPING IN U.S. 48. Others E-Mail me. I offer $$ off average U.S. shipping costs.